King Abdallah II: Christians are an “integral part of the tissue of the Arab world"
Amman (Agenzia Fides) - The German Foundation for International Cooperation (GIZ, Deutsche Gesellschaft fur internationale Zusammenarbeit) sponsored the realization of a study seminar dedicated to the water emergency and sustainable management of water resources, which brought together in Amman representatives of Churches and ecclesial communities present in Jordan. The aim of the meeting was to reflect on this issue from a Christian perspective, also to identify useful forms and tools to sensitize the younger generations around this issue, vital for the future of the entire human family. 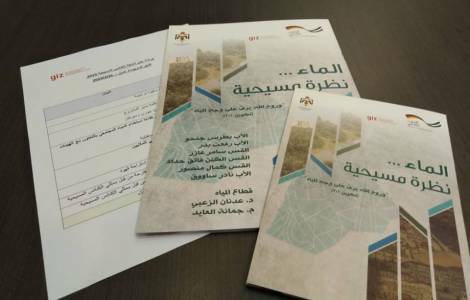 A similar seminar took place in Amman in October 2017, and had involved - as a prophetic vanguard in perceiving the relevance of the water emergency for the life of the populations of the entire region - representatives of the female Catholic religious communities present in the Hashemite Kingdom. During the seminar the proposal to set up "ecological committees" in Jordan's Christian schools was highlighted in order to help students become more aware of the urgent need for a sustainable use of water resources, which avoids any form of waste . ASIA/MYANMAR - Cardinal Bo: "No to the dam that deprives us of 'our mother', Irrawaddy"